For award-winning pancakes, gold star quesadillas and more, the Vremi Heavyweight Champ Cast Iron Griddle is the ultimate kitchen warrior. With 20 inches of pre-seasoned power, built-in side grip handles for secure transport, and a grease slope for capturing excess fat, it slow cooks foods evenly without scorching to deliver healthy, chef-quality, cast iron deliciousness. 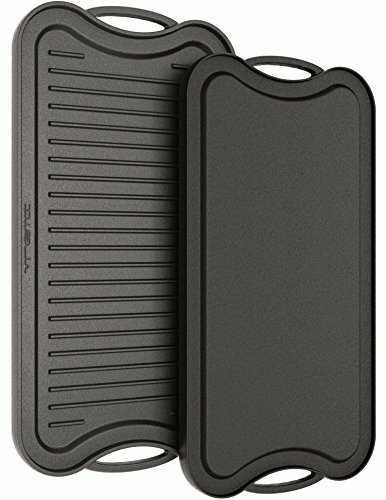 Use the smooth flat griddle side for everything from eggs to grilled cheese panini. Flip it over to the grill side, and sear your way to juicy steak, BBQ ribs or veggie kabobs. Our universal and portable 2 sided griddle grill is built for dual burner gas stove tops.